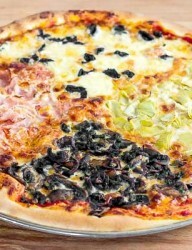 Quattro Staggioni (four seasons in English) is something that you would not find at your regular pizza place. This pizza sounds too much more like a sampler if you ask me but I remember enjoying it some years ago in a long lost restaurant in a different country. This is all that I usually need to start digging information about a specific recipe, so here it is. It is divided in four sectors with different ingredients, one for each season. Probably Italians thought of this one too but for some reason I cannot find any lore about it, maybe is a closed guarded secret or they don’t really care too much about it. However, there are some basic rules regarding what ingredients go with what season, for example: spring belongs to cooked ham (prosciutto cotto) and black olives, summer goes with artichokes and anchovies, autumn with tomatoes mixed with mozzarella and finally winter, simply mushrooms. Personally I got lost when reading about artichokes because I don’t really like them but then I thought, “dude, you’re a foodie, grow a pair” so I went on with it, with some changes of my own of course. Using the same pizza dough as always, I went to work, making my own version of pizza quattro stagioni but not very different from original. I used back bacon instead of prosciutto and provolone instead of mozzarella; also sauteed mushrooms and sun-dried black olives (if you know what is best for you then buy these), and finally marinated artichokes (couldn’t be bothered with fresh). Before I forget, classic recipe requires tomatoes as well but I decided to go on without and it wasn’t a bad idea, pizza looked great. 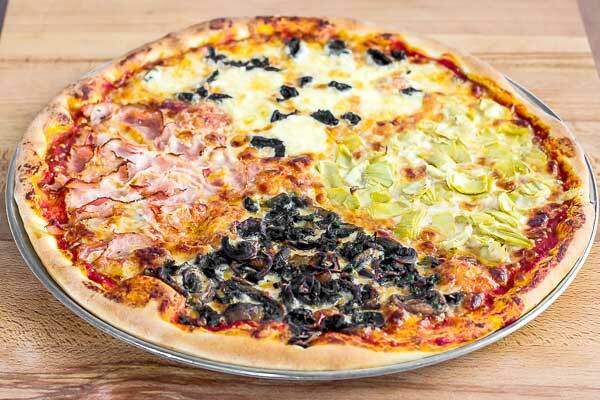 Taste wise, what can I say, main problem with pizza quattro stagioni is which side to start with first… and I don’t like artichokes, remember. Did I say I don’t like leeks either? Though wife makes a killer breakfast with them but that’s another story for another time. Anyway, back to the point, it was very good, definitely another great pizza to add to my recipe collection. 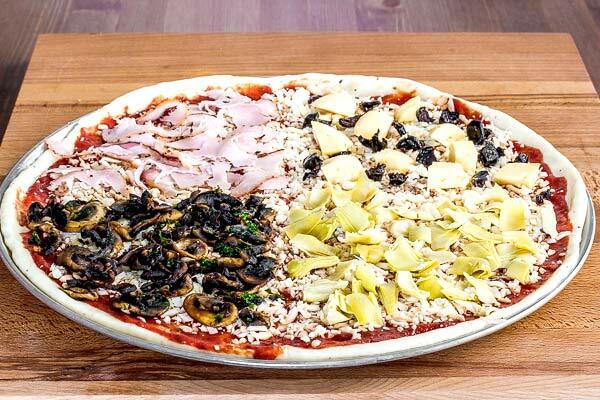 Having multiple toppings onto the same dough makes it easier for everybody to enjoy whatever they like… and they will. Generously spread pizza sauce all over the dough then sprinkle shredded mozzarella. 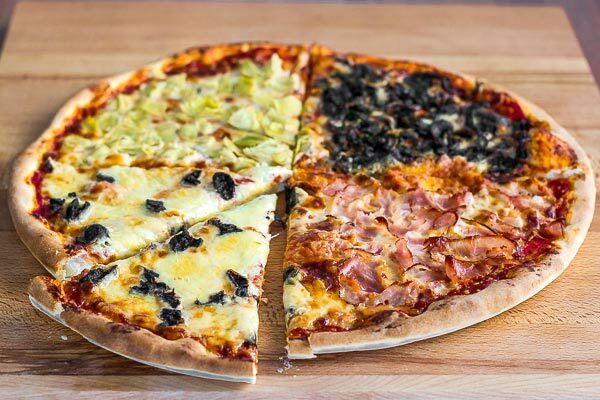 Visually divide the pizza into quarters and start filling them the way you see fit. Mine had artichokes on one side, Provolone and black olives on another, back bacon on third quarter and finally mushrooms. Bake for 10 to 15 minutes or until cheese is bubbly and crust is puffy-golden. Hey, it seems you have the seasons mixed up – Should be Spring for artichokes, Summer for tomatoes or basil, Fall for mushrooms, Winter for ham, prosciutto or olives. FYI It’s meant to be one ingredient per season (excluding tomato base and mozarella, of course), hence my use of “or” not “and” although modern chefs are mixing ingredients and rarely separating the seasons.